DUBAI, U.A.E., 13th November 2014: Emirates Engineering marked another milestone when the team performed its first 3C-Check on an A380, a major overhaul that restores the airline’s first A380 aircraft to near pristine condition. In a round-the-clock operation taking 55 days, two teams of highly specialised engineers stripped the entire interior of the double-decked aircraft to the bare metal hull, inspected and overhauled every single part, and then put the plane components back together again. “The entire check is meticulously planned with no room for delays. Grounding an aircraft for such a long time is a tremendous expense which means that our engineering teams must not only work extremely efficiently, but also deliver to a superior standard,” said Colin Disspain, Vice President of Base Engineering at Emirates. The check was completed with a rigorous test flight before being put back into regular service, in this case, carrying passengers to Brisbane and Auckland. Emirates was the first airline to place an order for the iconic A380, and is today the world’s largest operator of this efficient and spacious twin-deck aircraft. The airline’s first A380 (registration EDA – Echo Delta Alpha) was delivered in June 2008, and deployed on the airline’s inaugural A380 flight from Dubai to New York. Flight hours, landings and aircraft age determine the due date for a 3C-Check. In this case Echo Delta Alpha had flown an impressive 20 million km, the equivalent of almost 27 return trips to the moon. It has completed over 3,000 take-offs and landings, carrying over 1.2 million passengers safely across the globe. Months of meticulous planning led up to the C-Check on Echo Delta Alpha. Even though the experienced team of engineers have performed hundreds of C-Checks on the various aircraft of the Emirates fleet, this check was out of the ordinary simply because of the tremendous size of the A380. Operated until a few hours before the check, Echo Delta Alpha was towed into one of the Emirates Engineering hangars at Dubai Airport. 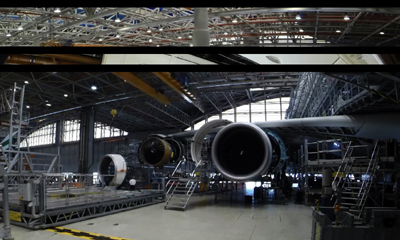 Purpose-built for the A380, each hangar is as large as two football fields. In the first 12 days of the check, over 1,600 parts were removed from the cabin interior including 475 Economy and Business Class seats, 14 First Class private suites, 16 galleys, 2 bars, 2 showers, floor panels and even parts of the cockpit. Every part was inspected and – where required – replaced. A major part of the operation was the removal of two of the aircraft’s pylons which connect the engine with the aircraft’s wing. Each pylon holds a massive engine which weighs an impressive 6.7 tonnes. The last two weeks were dedicated to putting all parts back in place with all teams on a tight schedule. Echo Delta Alpha is one of Emirates’ fleet of 232 aircraft, including 55 A380s. Operating the biggest A380 route network of any commercial airline worldwide, Emirates currently serves 31 airports on 5 continents. To date, the airline’s fleet of A380 aircraft has carried 27.5 million revenue passengers, made over 68,800 trips and covered more than 405 million kilometres. Its Dubai-Los Angeles route is the world’s longest commercial A380 flight in operation, and its Dubai-Kuwait route is the world’s shortest. By the end of this year, the number of destinations served by an Emirates A380 will increase to 33, with the addition of San Francisco from 1st December and Houston from 3rd December.